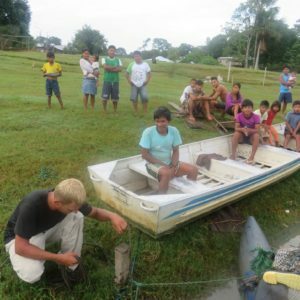 “Muito perigoso” – pirate stories from the Amazon. 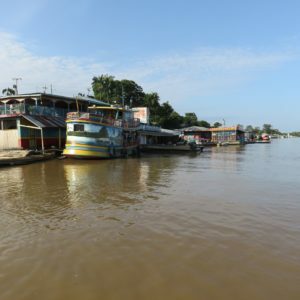 Colorful t-shirt, loose pants, flashy sunglasses, the best if “ray-bans”, and bleached hair – that’s the look of a typical pirate robber on Amazon waters between Tefe and Manaus in the Brazilian territory. Nothing like Johnny Depp of “Pirates of the Caribbean” or even Captain Hook from “Peter Pan”. Not looking for a chest of gold, he is interested in a slightly different kind of booty – drugs. 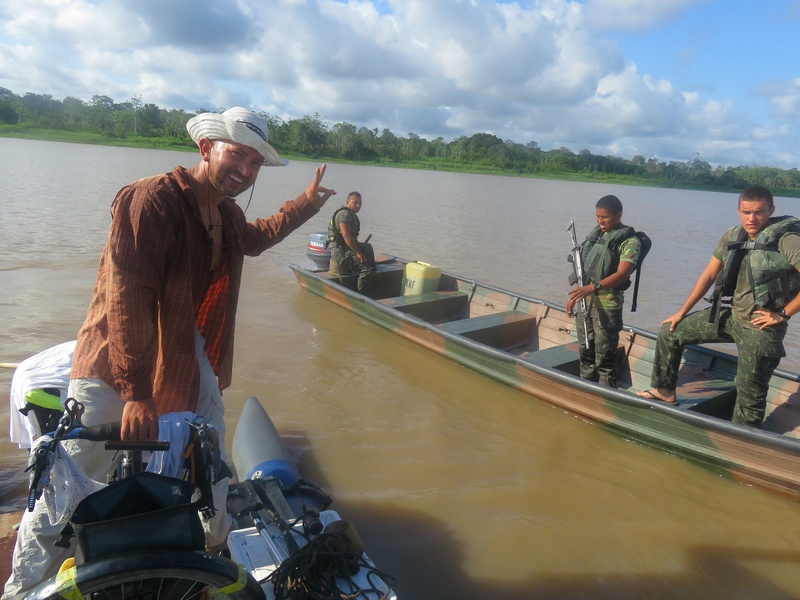 Within a few days of biking the Amazon, brothers Dawid Andres and Hubert Kisinski found out on their own skin, three times, that the encounter with the pirates has nothing to do with the adventure tales from “Treasure Island” by Stevenson or Sabatini ‘s “Captain Blood”. 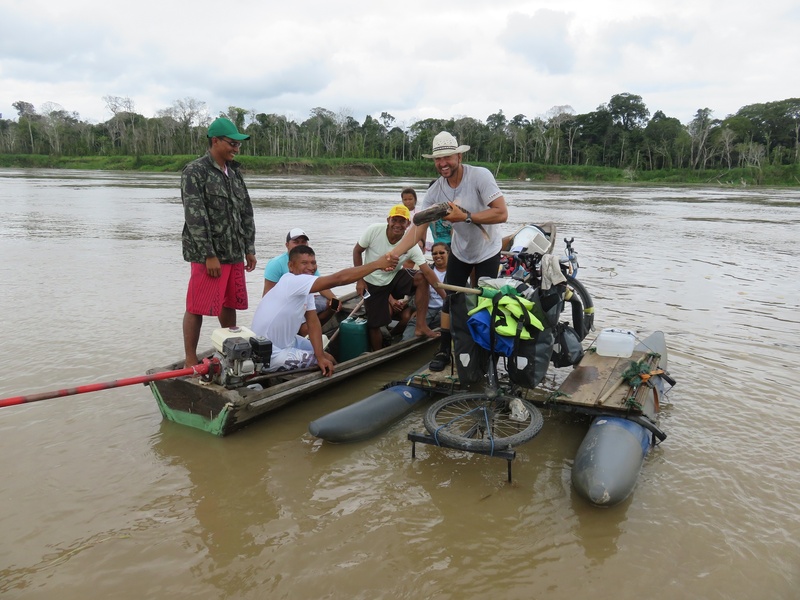 After Christmas spent with Colombian friends in Tabatinga, the brothers had a new verve of life and jumped on their bikes and stormed the Amazon. 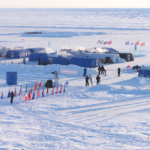 On the first day they beat their record by covering a distance of 100 km. 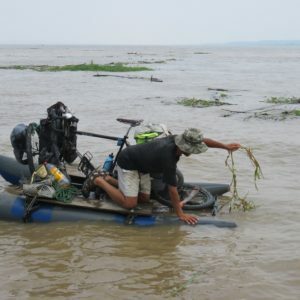 Facilitated by the rapid current of the river, they soon achieved another success – 130 kilometers in one day. 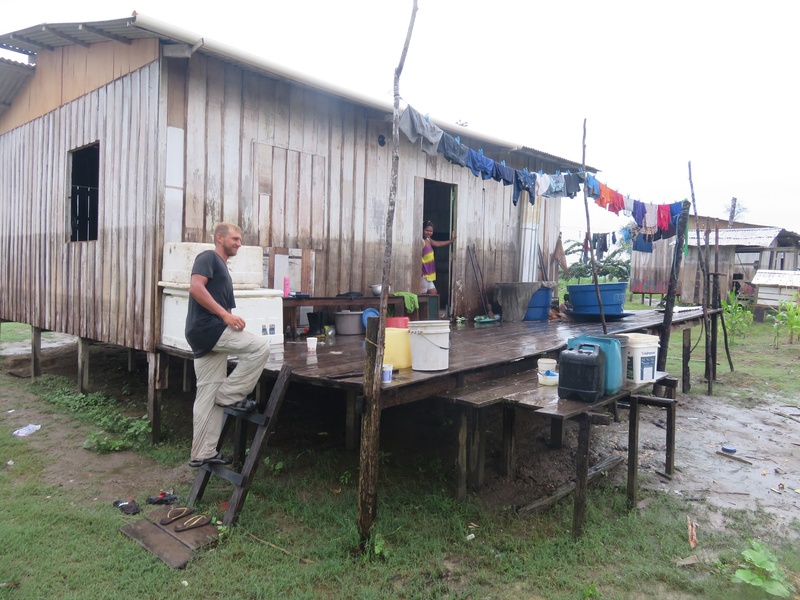 The first days in Brazil, however, passed under the sign of longing for the Peruvian warmth. 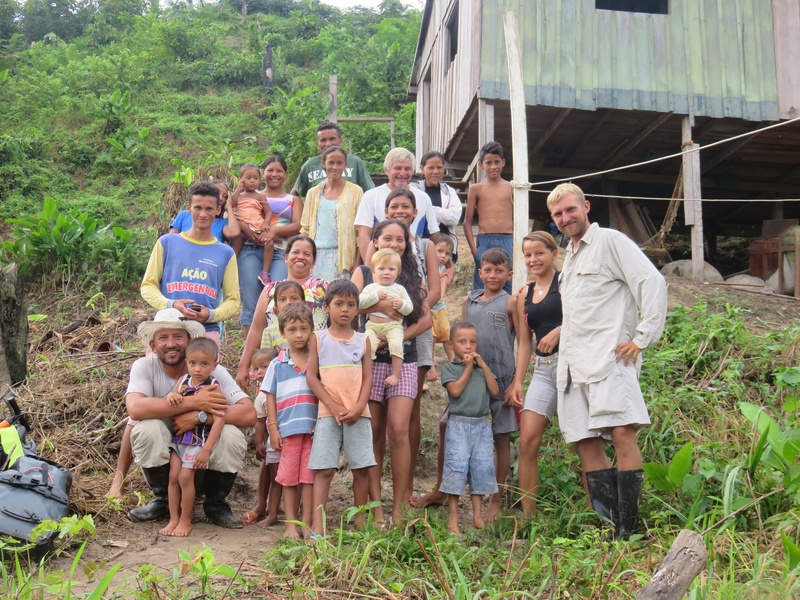 Accustomed to amiable meetings with the locals, the brothers faced outright hostility in relations between the nationalities ruling at the borders of Peru, Colombia, and Brazil. Somehow it backfired at the Poles, too. – The first night we spent at the beach – says Dawid. – The second night, we see a nice village, so we got to the bank and asked a man we encountered, if we could spend a night there. Immediately, he started yelling: Get out of here! Shove off! Get out right now! For the first time in four months we were met with such a response. We continue pedaling and soon there is a barge at the bank of the river. We asked the owner if we could spend a night on his vessel. He responds in Spanish, of course, no problem. It turned out that he was Peruvian. 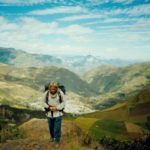 According to Dawid, an unpleasant attitude stems mainly from the fact that they were perceived as Peruvians – they speak Spanish, Dawid wears a Peruvian hat, and he is very tanned. 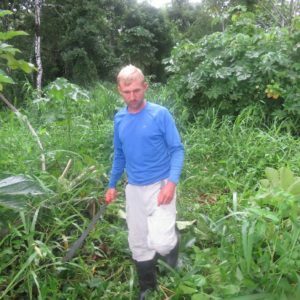 – Dawid, but how can they think that you are Peruvian, if you are nearly 1.90 meters tall? – Laughs Hubert. 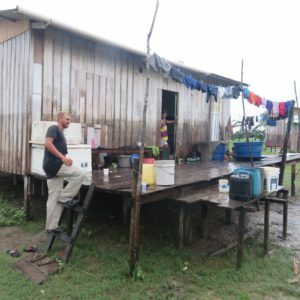 The farther into Brazil, the meetings with locals became friendlier, and the level of hospitality was growing every mile forward. The brothers have even started to get used to the routine that crowds of residents greet them on the shore, then somebody is raking all their belongings and moving them to one of the houses. Later, the decisions are made with whom travelers will sleep, with whom they eat dinner, and who will have them over for breakfast. 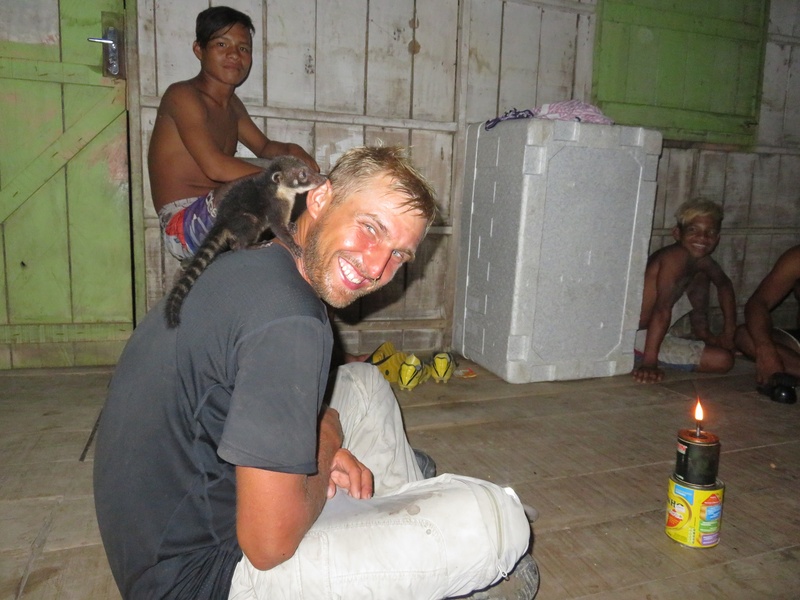 – We would rather sleep in a tent, especially at night that the heat indoors is difficult to bear – says Dawid. – I live in Arizona, so I’m used to the heat, but Hubert wheezes half of the night trying to catch his breath. 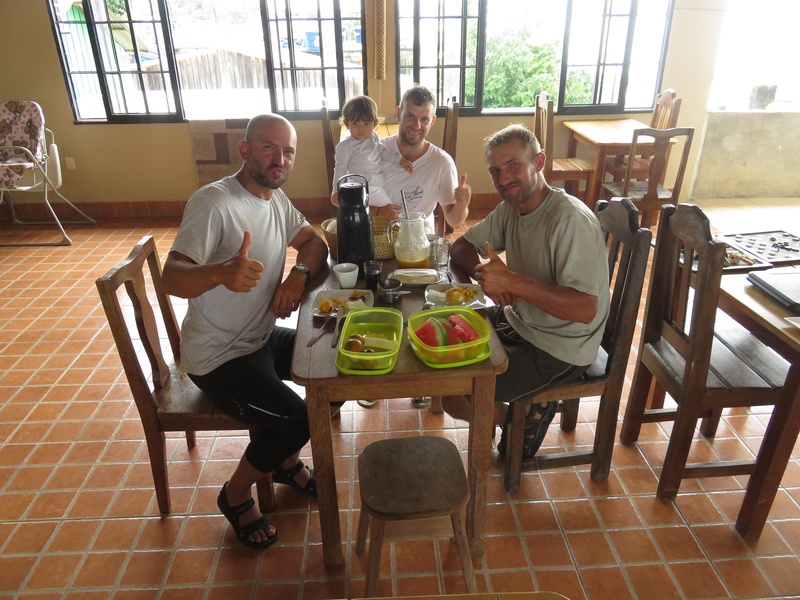 In addition, it is difficult to leave the hosts early in the morning; usually about 6-6:30. 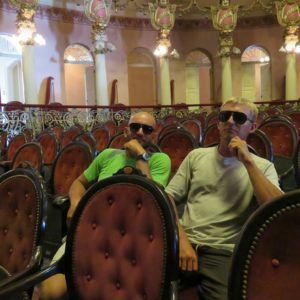 We were already on the way out, but here in the morning, you get a call: “Gentlemen, have some coffee with us, maybe some cookies” and by the time we say good-bye it is already 8 o’clock. Nevertheless, when they see how people spray mosquito repellent in the room where guests are supposed to sleep, prepare different varieties of fish dishes and Farina or dried yucca, how they are proud that they have “Polones” under their roof, the brothers cannot bring themselves to refuse that hospitality remembering the traditional Polish saying: “Guest in the house is God in the house”. 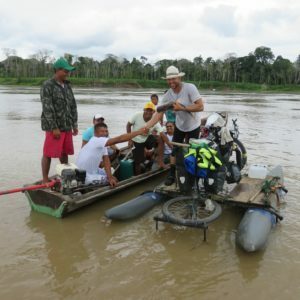 In each village in the Brazilian Amazon the basic main topic of conversation was biker’s safety. Or rather, threatening them with the river dangers. 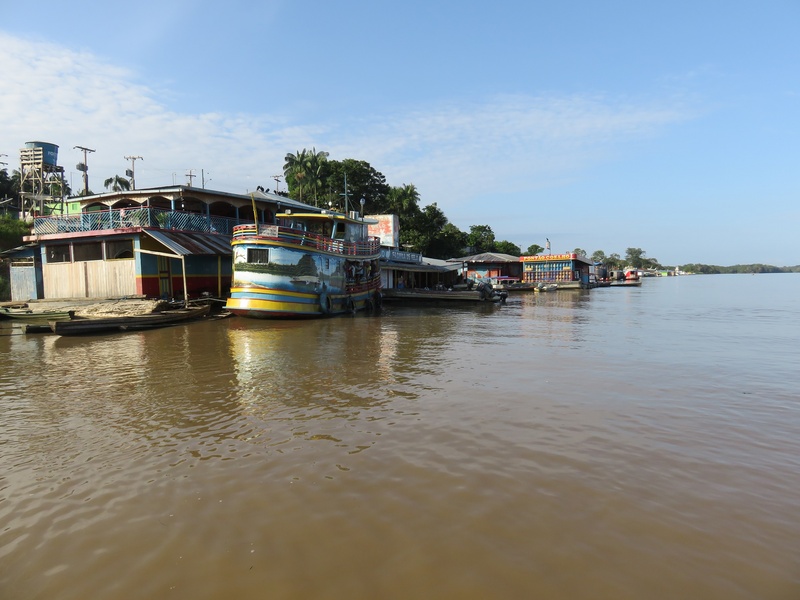 Residents themselves are afraid to venture farther than 20-30 km, fearing encounters with pirates, so they do not hide their amazement that the brothers traveled such a long part of the river and … still are alive. Therefore, they shower them with stories of fatal and tragic events, which they heard about, or had seen, or even … invented. 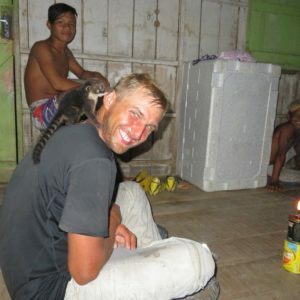 In almost every village, Dawid and Hubert learned about how last week, a group of Peruvians was killed, another group robbed, another injured in cruel way, and one story was about pirates who three weeks ago met on the river “three Poles on bicycles” and … trrratatatatata … had shot them all! – In these conversations you could feel that people cared about our safety. Sometimes though, I had enough of these warnings, they depressed me and actually I didn’t want to listen to them any more. 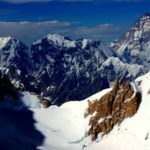 What could we possibly, do at this stage of expedition? 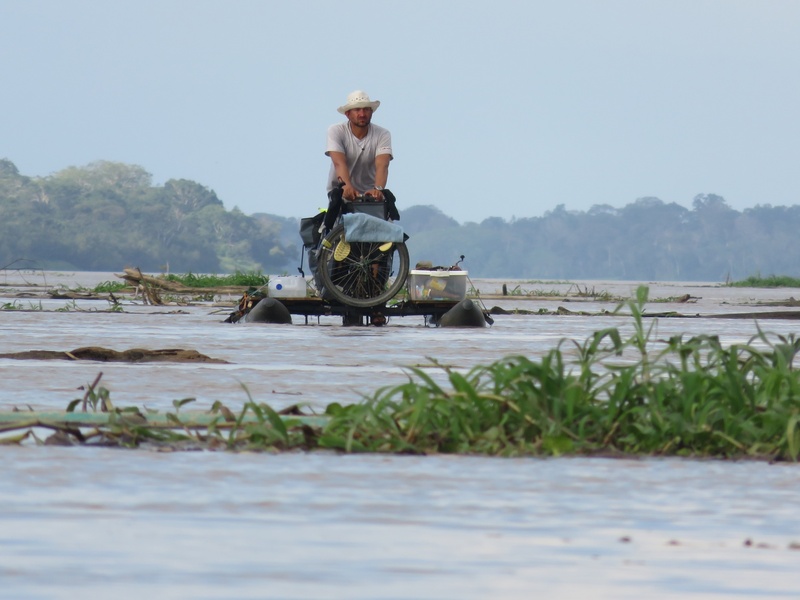 We had to somehow, cover that part of the river, and what is true – counting on our luck. 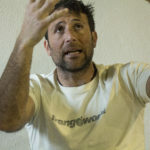 Even before the start of the expedition, the brothers were aware of the risks that Brazilians were talking about; they learned a lot about unpleasant experiences involving pirates from reports and stories of their predecessors, including me. 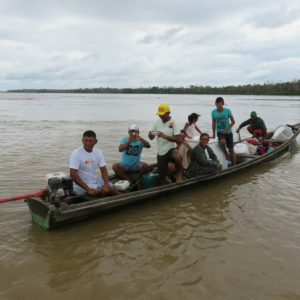 When in Tefe, during preparation for crossing the dangerous zone, they packed their electronic equipment and other valuable items in package, with the plan to send it somehow to Manaus. 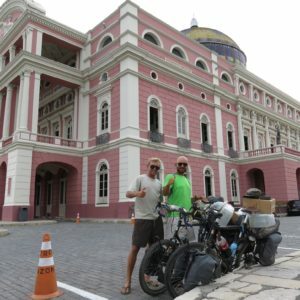 Luck would have it in the hotel, where they spent the night; they met Wlodek – a Pole who in a few days was flying nowhere else like just to Manaus! 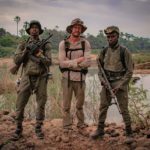 So, he took the package, and Dawid and Hubert equipped only with a small camera, cell phone and DeLorme – a device indicating their current location, hit the river to get to know another face of the Amazon. It was not long after leaving Tefe. 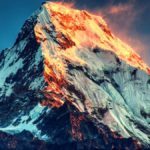 The brothers already were approaching a nearby village, where they intended to spend a night, when out of nowhere, a boat suddenly appeared next to them. On board, two young – 20-25 year old men; they don’t say anything, just stare. One constantly is spitting to the water. The fishing net placed at the stern of the boat, is completely dry. – Hey guys, are you from this village, which can be seen at the shore? We’re heading there to take a nap – first says Dawid. – And what are you doing here? The brothers already know that they might be in trouble. They do small talk with the newcomers; however, the conversation is terribly stale. -So…, do you care for a cigarette? – Hubert finally pulls out a pack in the direction of the boat. One says he does not smoke, but the other takes a cigarette and the lighter. They continue to gaze at the bikes and bikers. Cradled by the waves the pirate boat moves away a bit, increasing the distance between the confronting parties. One of the youths suddenly grabs an oar, and swiftly strokes toward Hubert’s bike. The pirate reaches out and … returns the lighter. 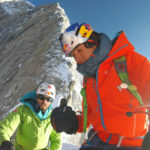 Dawid thinks to himself – it’s not bad. 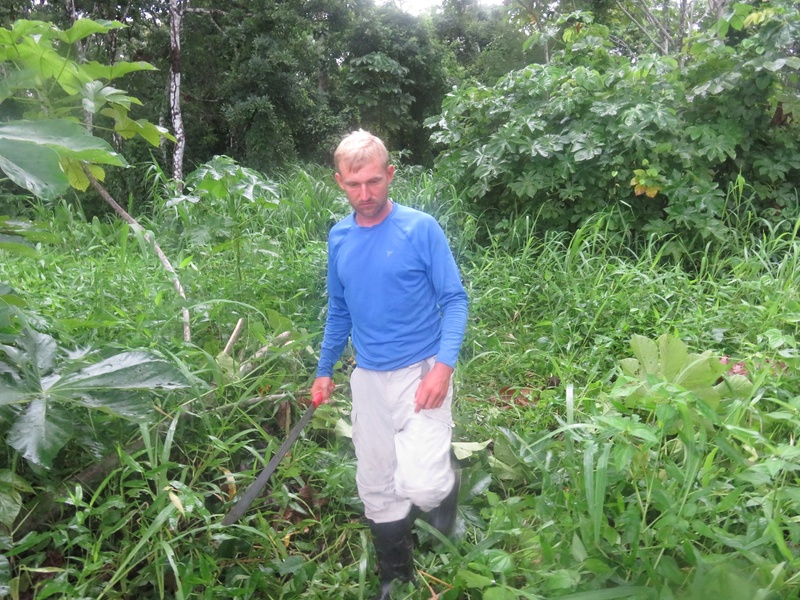 – You know what, guys, we’ll get going – says Dawid – to the village is still about two hours, and it will be dark, soon. Maybe you could bring some fish for dinner? After a moment of silence, a short answer comes. 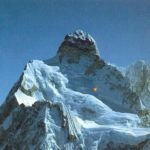 – O.K. We will bring. Of course, we saw neither them nor their fish in the village that night. 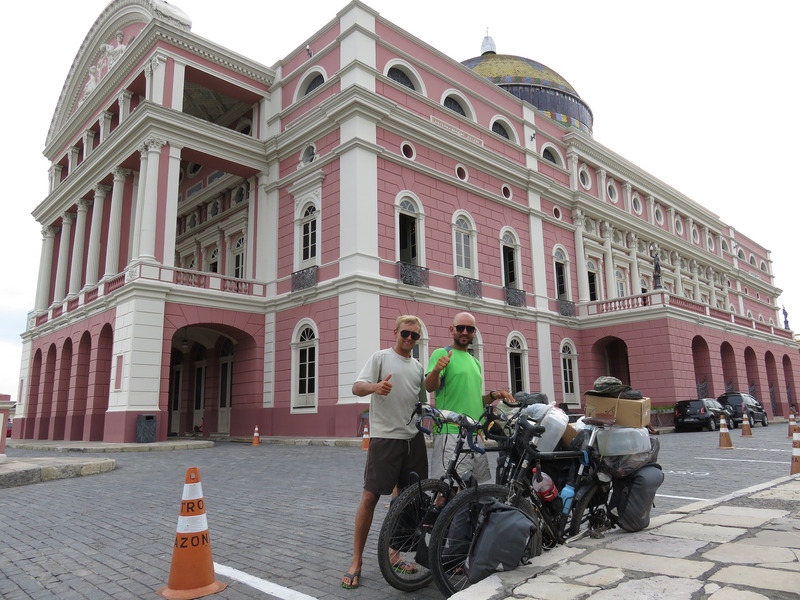 To Manaus was still about 330 km. 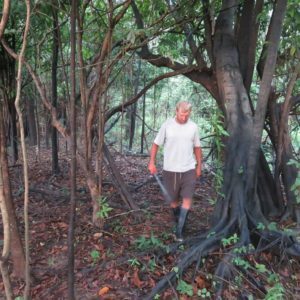 The brothers passed Coari and thought at the same time, that they already passed the danger zone – at least that could be concluded from the reports of recent explorers of the Amazon. Soon, though, they became aware that the territorial scope of pirate activities is much broader. The afternoon sun cast ever-wider smudges of light spilling already slowly onto the water; in three hours it will get dark. 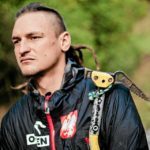 Dawid undertook probably one of the last attempts to chase Hubert during the time designated for rest. 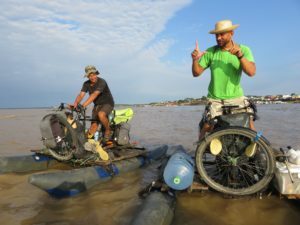 He is annoyed by a younger brother who moves fast like “crazy” (“brat, he made faster bike for himself” – Dawid complains every time, when we talk about the pace of pedaling), increasing the distance between their Amazonian bikes on the water. After 15 minutes of sharp pedaling they take a five-minute rest. Usually, Dawid is spending two minutes of these five on catching up with Hubert. Recently, he rebelled and declared his intention to “use his five minutes on lounging on the tubes and not chasing the “crazy” on the river.” This time, however, something pushed him towards his brother and he joined Hubert despite losing those precious moments of rest. This time they pedaled together, weaving discussion about why Coari ends up the area of pirate activities. – Maybe it is because here is an open space and everyone can easily see them, especially since the river is completely empty – wondered Hubert. In fact, the river was empty and the banks were empty. 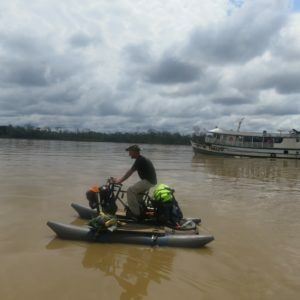 Only two bikes are moving with the Amazon current. Or rather, two bikes … and one boat. – Look Hubert, the pirates – says Dawid looking at the approaching boat. 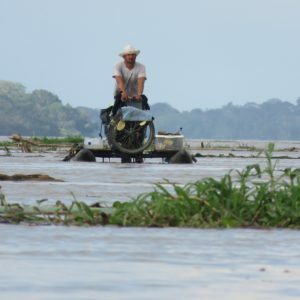 It was supposed to be a joke since often fishermen or others interested in strange vehicles running the river were approaching them so, they thought that this time also, someone wanted to talk with them, or take a photo. – Lovely boat – red, with shelter, looks like a tourist boat. It gets closer; two figures can be seen on board. It is five meters from bikers and then only three, another two meters, and it is already very close when suddenly, three armed thugs jump out from behind shouting: Stop! STOP! Hands on your head! – We stopped to stand up against five people aiming their guns at us. 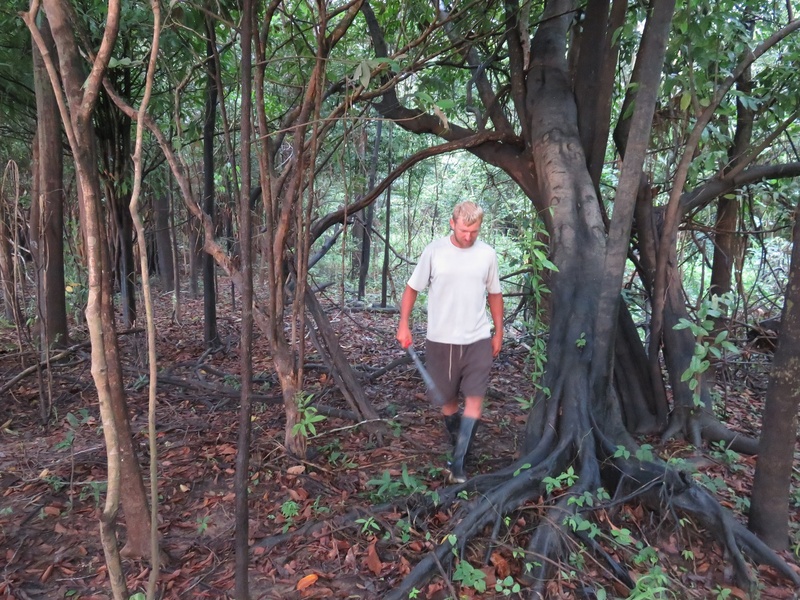 The one aiming at me had a shotgun as if he planed to kill an elephant – says Dawid. In their characteristic way, the brothers start a conversation. 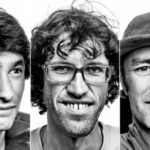 They talk about the expedition, about the river, and about their special bicycles. One with lush head of hair and a mustache, as musketeer, began to inquire why and where the brothers were going. He was probably the leader. And most importantly, he asked what was in that Peruvian bag on Hubert’s bike and wanted to see its content. Again screams: Hands on your head! Do not move! – when Hubert moved to show what was inside. The younger of the attackers jumped into the water, diving under the inflatable runners of our water bikes to inspect them. He runs his hand along each tube; luckily it did not occur to him to cut them open, looking for drugs. Next he checks other bags and pockets. In one, there is a stove, some gasoline and some wires. Growling asks what is underneath the Peruvian bag. Hubert with his foot points to the drive of his bike – there are spare drives in the bag!. Finally, the swimmer returned to the boat. It’s not bad, thought the brothers, nothing is destroyed or tossed to the water, and they stopped aiming their weapons at them. – Do you have any beer, maybe? – Asked Dawid, causing consternation not only among the pirates, but also in Hubert, who never suspected his brother of such audacity. – Or maybe, you have some drugs? They do not have them either. They only laughingly cried out “OBRIGADO” (thank you) and departed. – Obrigado! – Dawid cried in unison with Hubert quite surprised by such courtesy at the end of the encounter. 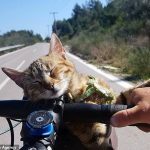 Immediately, they rushed to pedal almost without interruption. 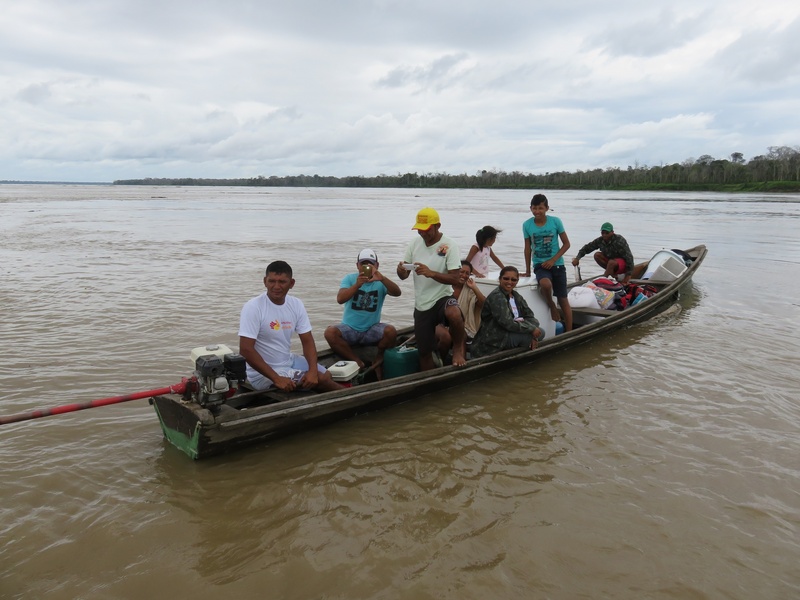 Fortunately, fast water helped them moving at the speed of 11-12 km/h and they reached the nearest town at about 9 in the evening. 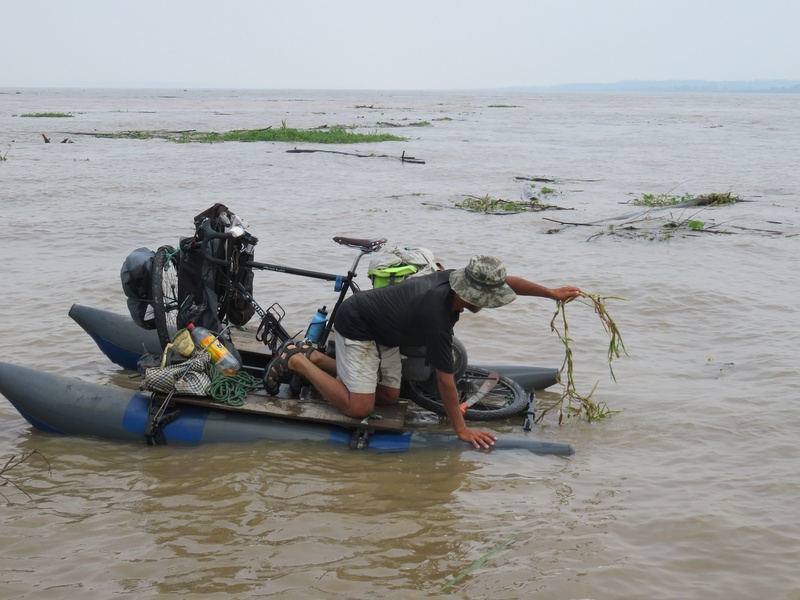 The next day the waves on the river were huge; they carried the bikers even without pedaling. So they drifted around, enjoying scenery and reminiscing yesterday’s events. Around noon a boat appeared again. The boat stopped in the middle of the river and didn’t move from there for a long time. Maybe it broke down, thought the brothers trying to convince themselves of that possibility. Intuitively, however, they sensed something different. And rightly so, because as soon as the waves calmed down and the bikers began pedaling straight towards the boat, it glided swiftly, across the water to stop at the left bank. – The engine on the boat was running all the time – says Hubert. – The boat drifted with the current, together with us, correcting its course occasionally. During that time, we were carefully watched through binoculars. 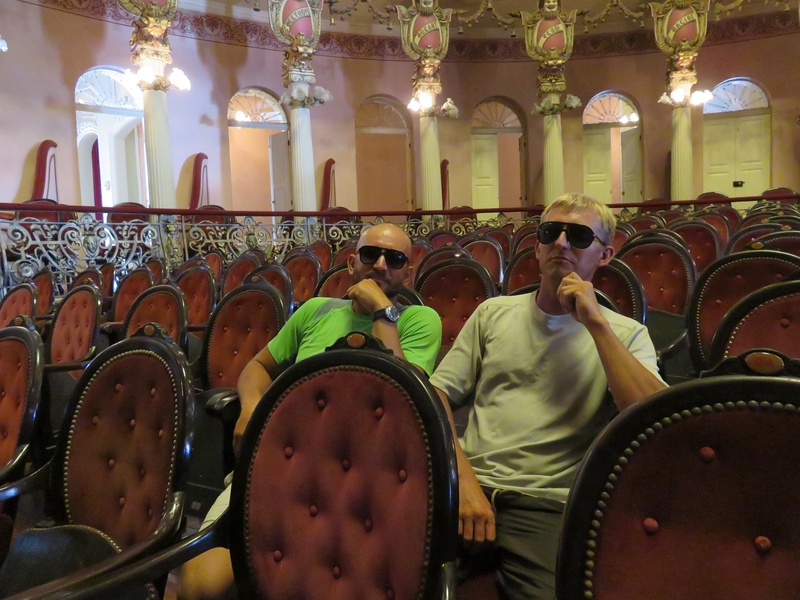 Damaged by water, the brothers’ binoculars were not suitable for satisfactory tracking. They came up with an idea to look at the boaters through their camera lens. 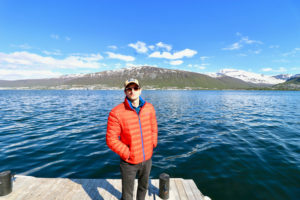 – Dawid took out his camera and began to take pictures; at this point the boat went vrrroooom! And took off! – Continues the younger brother’s story. 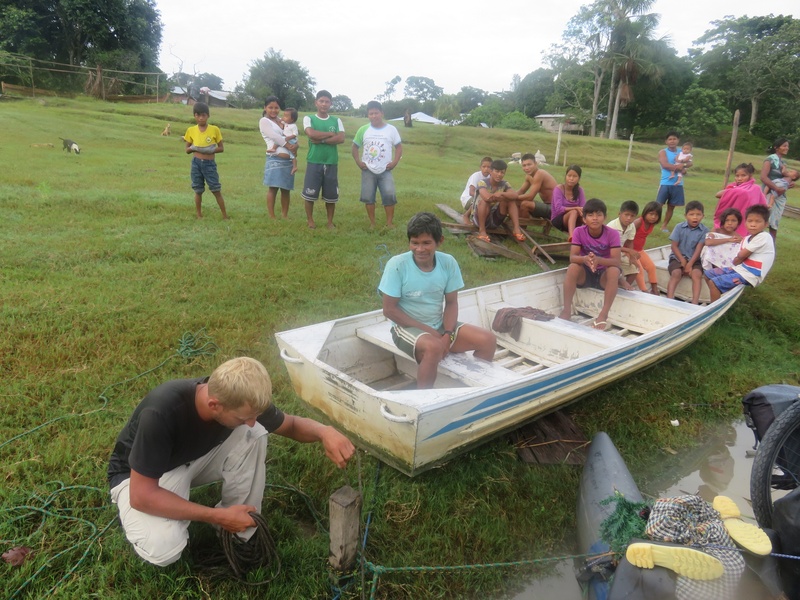 – The boat pulled away about 500 meters, then again came closer, and moved away again. The boat kept coming close to us and moving away for the next 4 hours. The distraught brothers thought it would have been better if the pirates got to them “did what they wanted”, and didn’t torture them with not knowing what was to happen next”. Unexpectedly, there was a ringtone on their mobile phone. They had entered an area where a phone signal became available. The phone started ringing like crazy and the water was resonating the sound. This was the time when I finally was able to reach the brothers after receiving the alarming message they sent to me some time previously from DeLorme. The boat stopped and stood there, disappearing behind the moving bikers. 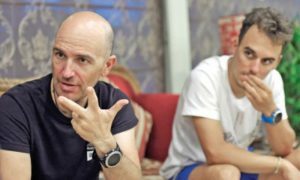 – It was a real mental anguish – Dawid assesses the situation. 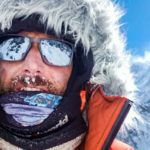 – It was the worst experience of our trip. 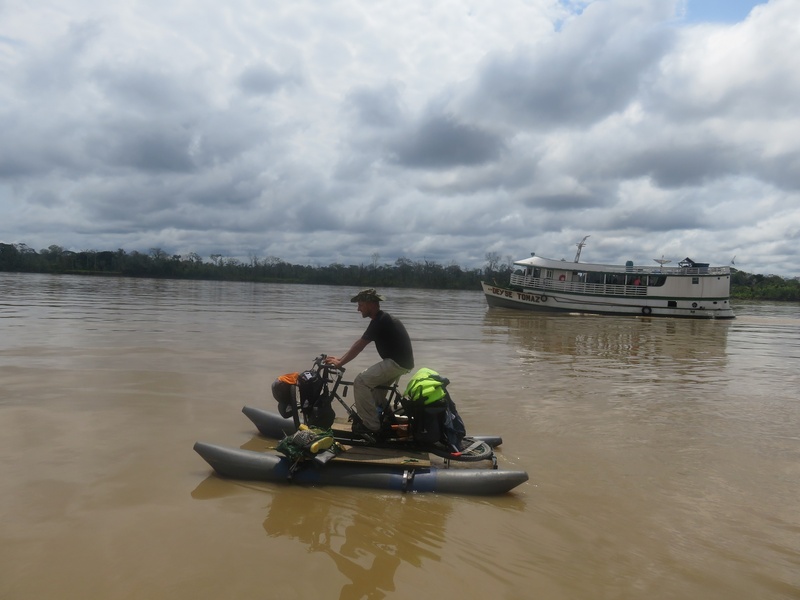 With a bit of relief, and without any more pirate incidents, the brothers docked two days later at the town of Manacapuru where they replaced floating runners on their vehicles with wheels and arrived in Manaus overland.